Inform yourself before making your decision. How do you know whether you should get a dental crown? 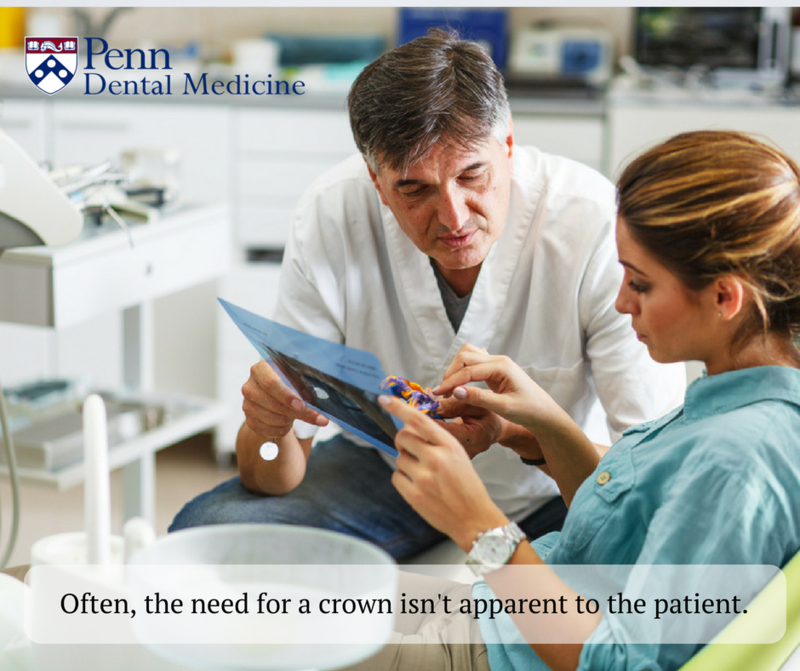 Sometimes, the need for a crown isn’t initially apparent to patients. Even if the tooth isn’t broken, a crown may be necessary to provide a permanent, protective covering for the tooth (such as after a cavity or root canal treatment). You may also be recommended a crown instead of a filling when a larger cavity is involved. Maybe you’ve been looking for affordable dental crowns and you’re not sure where to start. Although the search may seem difficult or complicated, there’s only a few things that you really need to know. Penn Dental Medicine is here to address these five common myths about affordable dental crowns. Myth 1. Affordable dental crowns don’t exist (or are so low-quality that they wouldn’t be worth it). While crowns are more expensive than a filling, that doesn’t mean that high quality, affordable options don’t exist. At Penn Dental Medicine, we transfer discounts to the patient each time we do a procedure. Offering low-cost, affordable dentistry is possible for us because of the central mission of our educational clinic. We use all the same excellent materials, but charge less for services. That’s why it’s possible to get a cheaper dental crown from us without experiencing any reduction in quality. Myth 2. Dental crowns look fake and unnatural. Most patients opt for dental crowns that are tooth-colored so that they blend in perfectly with their natural teeth. While there are options for metallic or gold crowns (which do have better longevity), these are typically applied to the molars where they aren’t visible. A porcelain or ceramic crown is custom-made to match your existing teeth so that no one will be able to tell the difference. Myth 3. Crowns last forever. Even though quality crowns are durable and can last for some time, they aren’t a permanent solution. Depending on the type of crown you get and how well you take care of it, you’ll likely need to replace it within five to ten years. To ensure that they last as long as possible, you should keep up your regular visits to the dentist for dental cleanings. Regular cleanings can extend the lifetime of your crown, and allow your dentist to monitor and replace it in a timely manner. Myth 4. You can’t get a cavity under a crown. This common myth may come from a confusion between crowns and implants. With a dental implant, it is impossible to get a cavity because the entire tooth has been replaced. But crowns cover a natural tooth, which is still vulnerable to dental decay. So though the artificial (crown) surface of the tooth can’t get a cavity, you could develop one in the part below it. Be sure to floss and brush regularly to keep the area clean and resistant to bacteria. Myth 5. A crown won’t break, chip, or crack. While crowns are made of hard, durable materials, they aren’t invincible. If you bite down on something hard or suffer dental trauma, you could potentially break the crown. This is a reminder to take good care of your crown so that you don’t have to spend extra money on them. The good news is that dental crowns are fairly easily repaired or replaced. Get Your Crown at an Affordable Dental Clinic! At Penn Dental Medicine, patients enjoy high quality care at discounted rates. Like with our other procedures, you’ll find that getting a dental crown is significantly less expensive at PDM than at nearby private practices. Our affordable dental crowns are made of industry-standard materials and placed by student dentists at the final stages of their education, who are in turn overseen by the dental professionals at Penn Dental Medicine. We hope that by offering lower prices on dental crowns, patients will make the best decisions regarding their oral health. To schedule your consultation with a Penn Dental Medicine dentist, please call our offices at 215-898-8965.